To practice safely alpine skiing, skiing, snowboarding .. individually, as a family or as a group, think of the snow card. You can buy it directly from the ski school. 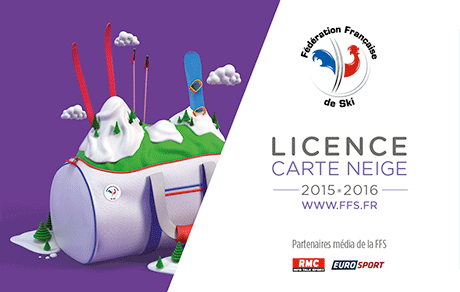 The Snow Card License is available in the 1200 FFS ski clubs, spread all over France as well as in all skischools in France. You have the guarantee to ski insured. - First help free on the slopes and freeride. The Carte Neige License is intended for both beginner and experienced skiers. 2. Take part to several animation organised by the Ski Club. 4. Geting a good supervision provided by our federal instructors to progress quickly and having fun. 9. Become a ski coach or fédéral monitor. 10. Get many benefits offered by FFS Benefits Club partners. Mountain rescue can be very expensive. the French Ski Federation advises all its members to take out insurance cover. Different option are proposed to meet the needs of each, at advantageous pricing conditions reserved for its licensees. These insurance options offer guarantees adapted to sports activities practiced in the mountains, winter and summer, in France and around the world.